With the startling new finding of dozens of Earth-sized extrasolar planets, NASA’s Kepler planet hunting space telescope has just revolutionized our understanding of Earths place in the Universe and the search for Extraterrestrial Life. And the historic science discovery is based on data collected in just the first few months of operation of the powerful telescope as it scans only a tiny portion of the sky. The discovery of 1235 new extrasolar planet candidates was announced today (Feb.2) by NASA and Kepler scientists at a media briefing. 68 of these planet candidates are Earth-sized. Another 288 are Super-Earth-size, 662 are Neptune-size and 165 are Jupiter-size. Most of these candidates orbit stars like our sun. Even more significant is that 54 of the planet candidates are located within the ‘habitable zone’ of their host stars and 5 of those are Earth-sized. Before today we knew of exactly ZERO Earth-sized planets within the habitable zone. Now there are 5. Finding a ‘Pale Blue Dot’ or ‘Second Earth’ inside a habitable zone that harbors water and environmental conditions that can support life is the ‘Holy Grail’ of science. “We went from zero to 68 Earth-sized planet candidates and zero to 54 candidates in the habitable zone – a region where liquid water could exist on a planet’s surface. Some candidates could even have moons with liquid water,” said William Borucki of NASA’s Ames Research Center, Moffett Field, Calif.. Borucki is the science principal investigator for NASA’s Kepler mission. Earth-sized water worlds are the most conducive to the formation and evolution of alien life forms. Water is an essential prerequisite for life as we know it. Kepler is the first NASA mission capable of finding Earth-size planets in or near the habitable zones around their parent stars. The mission uses the transit method to detect the tell tale signatures of planets. The goal is to determine how common are planets the size of Earth orbiting inside the habitable zone of stars like our sun. Kepler measures the miniscule decreases in the brightness of stars caused by planets crossing in front of them and blocking the starlight. Imagine calculating the difference in light transmission caused by a flea sitting on a cars headlight. Follow up observations over a period of several years will be required to confirm these results, the scientists explained. Astronomers expect that over 80% of the candidate planets will be positively confirmed as real planets by utilizing ground based observatories and the Spitzer Space Telescope. For an Earth-sized planet orbiting a sun-like star inside the habitable zone, transits occur about once per year. Since three transits are required to verify a planets status, it will therefore take about three years to reach a definitive conclusion. These remarkable new planet discoveries are based on observations from only the first four months of Kepler’s telescopic operations – May 12, 2009 to Sept. 17, 2009. The space based observatory continuously monitors more than 156,000 stars using 42 CCD detectors with a field of view that covers only 1/400 of the sky. “Kepler has shown that planetary systems like our own are common,” said Debra Fischer. Planets in Keplers Field of View. Before and after the discovery of over 1200 planet candidates by NASA’s Kepler Space Telescope. “The search for planets is motivated by the search for life,” Fischer added. “Thanks to Kepler for this treasure chest of data!” Fisher concluded. 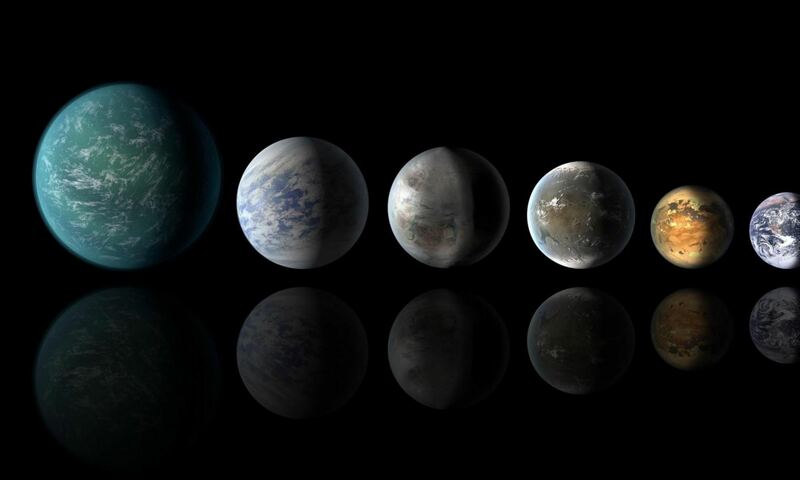 Kepler is just the first step in finding Earth sized and Earth like planets. “We are building the foundation for future generations of explorers,” said Borucki. The first planets beyond our solar system were discovered in 1995. Up to today there were just over 500 known extrasolar planets. Kepler now has 15 confirmed extrasolar planet discoveries and over 1200 possible candidates. In January 2011, Kepler confirmed the discovery of its first rocky planet, named Kepler-10b. The molten world measures just 1.4 times the size of Earth and is the smallest planet ever discovered outside our solar system. Kepler’s science operations are currently funded for three and one half years of operations until November 2012. The mission’s lifetime – and its goal of discovering multitudes of new planets as small as Earth – can be extended if NASA funding is approved by Congress and the President. Video Caption: NASA’s Kepler mission has discovered its first Earth-size planet candidates and its first candidates in the habitable zone, a region where liquid water could exist on a planet’s surface. Five of the potential planets are near Earth-size and orbit in the habitable zone of smaller, cooler stars than our sun. Kepler also found six confirmed planets orbiting a sun-like star, Kepler-11. This is the largest group of transiting planets orbiting a single star yet discovered outside our solar system. Located approximately 2,000 light years from Earth, Kepler-11 is the most tightly packed planetary system yet discovered. All six of its confirmed planets have orbits smaller than Venus, and five of the six have orbits smaller than Mercury’s. David Charbonneau, an exoplanet researcher at Harvard University, explains what scientists mean when they say “earthlike planet” and “super Earth.” This interview was recorded at NASA’s Goddard Space Flight Center on December 10, 2010, by NASA science writer Daniel Pendick. An image by Carter Roberts of the Eastbay Astronomical Society in Oakland, CA, showing the Milky Way region of the sky where the Kepler spacecraft/photometer will be pointing. Each rectangle indicates the specific region of the sky covered by each CCD element of the Kepler photometer. There are a total of 42 CCD elements in pairs, each pair comprising a square. Credit: Carter Roberts / Eastbay Astronomical Society. Delta 2 rocket streaks to the heavens. No less momentous for being expected, the possibility that we have somewhere else to live is a radical shift in our perception of the universe. The real seismic event will be the first pictures of blue seas and white clouds and then green stuff on the land and the tell-tale spectrum of organic life. 1000 light years is currently an impossible distance though, how far away is the nearest candidate? This is really exciting. I have a strong feeling that the final results of the Kepler mission will change everything. We will have solid numbers to plug into the Drake equation. We will have specific candidate planets for further study as well as a strong incentive to fund those studies. Nearby stars will be next to be surveyed. By the time my child grows up I hope to know that there are dozens of life-infested worlds out there being studied. Excellent article putting Kepler’s new exoplanet discoveries into perspective. How lucky we are to see the rise of a new field, exoplanet astronomy, and the future looks bright indeed! Hmm… 68 earthlike planets observed in a selection group of approximately 156,000 stars. That’s only .000436% Yet Astronomers estimate that there are 200 billion to 400 billion stars in the Milky Way galaxy… so lets use 300 billion X .000436 = 130,769,231 stars possible with earthlike planets. Now lets say that only 1/100 of those stars might exist in stable planetary systems and then another 1/100 orbit stable stars of whatever classification. That leaves 13,077 candidate star systems in our galaxy….. The numbers keep improving! You are missing some observation bias factors. – Kepler can only see transits from our perspective, so ~ 3-5 % of actual systems with planets. – Candidate systems will tend to have stable systems (mainly because they are single planets). – Candidate stars will tend to be stable (mainly because a) they are stable enough for transit methods b) they have planets). You underestimate with many orders of magnitude, see alternative estimates below. The fraction of planets with orbital planes aligned for a keeper detection declines with the radius of the orbit. I have seen one estimate that one in 1,500 planets with one AU orbit are detectable. So, to have a few dozen habitable zone planets translates into thousands!! These results also mean that practically every star has planets, and likely many planets! Very exciting stuff. This was the expected result. Good to see though. There are likely many more smaller planets not being detected which is why the data is skewed to larger ones. Also the data is skewed towards closer and shorter orbits due to the short observing time. That will change if the observatory remains functional for 3 years. Any way you look at it, the data is impressive and should inspire more detailed missions. Awesome. This is very exciting. I hope a star map will be available so that we can see what stars these planets orbit, their distance and whether there is any patterns relative to star composition. Great job on the article too! Keep in mind that as Kepler uses the transit system, it’s only noting planet orbits aligned with our view. Has anyone done the math to get the number of actual planetary systems this suggests? I would think you could multiply by many hundreds to come up with the appropriate number. As well, if we’re looking for TRULY earthlike planets, then their orbit will take much longer to confirm. Clearly, we are one of many, many worlds and it’s only a matter of time before we do find the holy grail, which is not earthlike worlds in the habitable zone but worlds with life. I’ll await confirmation – if it is even forthcoming with today’s instruments. Off by one there. Humans discovered it in prehistoric times. It happens to be exactly the same size as Earth, and exactly the same shape, and looks exactly the same. I’m even posting from it. After the Gliese g drama hope that this turns out to be true…. Have full faith in NASA. There is no Gliese g drama. Given Kepler data, how many planets with life should we expect to find within 1000 light years? 5 Candidate habitable zone planets, 1000 light years, 1/400th of the sky, 4 months of observations. Lets say that 1 out of every 5 candidate Earth sized planets is confirmed. Lets assume that Kepler is not missing any transits at this planet size range (highly unlikely but lets be conservative). Lets assume we are interested in observing transits up to 1.5 Au. Thus we would need to extrapolate Keplers findings to 18 months. Thus we should find about 4 – 5 confirmed habitable zone planets in 18 months from Kepler’s data. For the whole sky (assuming the same number of stars are spread out over all the other sections o the sky) this would be 4.5 x 400 = 1800 habitable zone worlds within 1000 light years of Earth. Now this calculation is only for habitable worlds who’s orbit is directly aligned with our own (otherwise we wouldn’t catch their transits). I believe I remember reading that only 1 – 3% of all planets would be aligned in a manner to be observed with this method. Thus, it is more likely 1800 represents 1 to 3% of all habitable zone planets. Lets assume it’s 3%. That would mean that there are about 100 000 Earth sized planets within the habitable zones of their respective stars. Now lets be conservative again and assume 1% of these planets developed life. This is the most difficult to predict statistic as we have no sampling yet to run numbers on. I actually believe it should be much higher. I base this hunch on how quickly life arose on Earth. However lets stick to 1%. Thus there should be at least 1000 worlds within 1000 light years of Earth that are Earth sized, have similar orbital durations and developed life. But lets not stop here. How likely is it that any of these planets developed intelligent life? Assuming we use Earth as an example, life probably arose in the Hadeon – some 3.8 to 4.5 billion years ago. Lets be safe though and go with a more agreed date. Lets place it after the LHB period around 3.67 Ga. Homo Sapiens in their present form have been around for 100 000 to 200 000 years. Civilization for 10 000, and industrial societies for ~150 years or so. What are the odds – given Earth as a model – of running into any form of Intelligent life in 1000 light years? Well even at 200 000 years, odds are very, very low that any of these worlds would have intelligent life. Let me know if I am missing anything that can improve this calculation. Agreed. I think going through what little data we have right now is only satisfactory in a sense that it demonstrates the potential numbers are looking very good. That’s it – fund Terrestrial Planet Finder now. We need something in the works that can actually study these puppies. Also a thought – all of these Earth-sizers must be around red dwarfs right, or they wouldn’t have had time to get multiple transits? Or is that why they’re calling them candidates at the moment – they’ve had one pass with the signature light curve of a planetary transit but are now awaiting second and third passes to confirm? Candidates need independent verification, as is the case for all earlier acknowledged observations. Though it seems in the case of the 6 planet system that independent effects may suffice. (Here planets tugging on each other and affecting transit timing models, besides the pure transit effects.) I believe Kepler data is used “twice” for them (haven’t checked the paper)!? My turn to play the numbers game; it’s fun and educational. The Kepler mission projects 80 – 95 % of candidates being confirmed as real planets; the most optimistic number from the most experienced member. So, going by the first release projection of ~ 30 % of systems having planets, the Milky Way @ 100 – 500 Gstars will have ~ 0.3*50/1200*10^11 ~ 10^9 planets in the habitable zone and ~ 10^8 habitable planets (from 5 terrestrials out of ~ 50). The speed and simplicity of the stochastic process both argues that there is little deterministic hinder. So we can tentatively put the probability for life on habitable planets p ~ 1. Estimate becomes ~ 10^8 inhabited planets. Lane et al just had a paper robustly describing how the mitochondriate endosymbiosis that seems to define eukaryotes is energetically necessary for a large genome allowing specialized cells for multicellularity. They also mention that there is now evidence of at least 6 similar intracellular endosymbiosis events in prokaryotes. Walking through the statistics from a binomial model of mitochondrial type endosymbiosis we again arrive at a Poisson model but as an approximation, normalized rate ~ 0.8 (multicellulars after ~ 4 Gy). The difference is that it is too close for testing but sufficiently observed for estimate instead of bound. The closest Poisson process of lambda = 1 has ~ 36 % probability for multicellular potentiating endosymbiosis of cells @ 5 Gy old planets. IIRC the galactic habitable zone has ~ 10 % such planets at the current time. Let us estimate ~ 4*10^6 multicellular inhabitant planets. That is iffier. Many species have intelligence and tool cultures. (Corvids more than apes!) What allowed our lineage to achieve large brains is believed by some to be coevolution with better feeding strategies (collection, hunting, food preparation including cooking, et cetera). This could happen on both Earth analogs as well as water planets. Using the same model as for endosymbiosis on observed tool culture attempts, we would have another factor of ~ 40 % @ 5 Gy for human equivalent intelligence (HEI) among multicellular inhabitant planets. Estimate ~ 2*10^6 planets that will have HEIs at some time. Typical species life times are ~ 1 My; we youngsters will have ~ 1 My before our descendants takes over. (Likely these are HEIs too, of course.) If we spread this low estimate among ~ 1 Gy of "now", we will have ~ 2000 HEIs at any one time. This gives ~ 2*10^3/10^11 ~ 2*10^-8 of stars have HEIs. Milky way volume is ~ 3*(50*10^3)^2*10^3 ~ 10^13 ly^3, so ~ 1 star/ly^3 and we have ~ 2 000 ly to the nearest HEI. Oops, misplaced the decimal point here: ~ 0.01 star/ly^3. A couple questions: Did you account for the % planets Kepler would miss if they did not have orbits that permitted Earth visible transits? Also, did you extrapolate Kepler findings to account for transits that would be likely discovered beyond 4 months? I figured up to 18 months would be enough time to observe all transits from worlds with similar orbits to our own. Finally, does either of the above points matter? Using your calculations, what is the probable distance to the first inhabitable planet? Regardless of its star type, orbit, or development of lifeforms. The Kepler data is going to be a gold mine for papers and doctoral thesis papers considering how many planets it has already found. I was thinking that with so many discoveries that there is going to be a large enough sample to draw some conclusions with a reasonable degree of certainty (low enough p value or reasonably narrow confidence interval) about planets are found and in what confoguration around different classes of stars. To me this is where the data can get very interesting. Can I expect planetary systems around a yellow dwarf to be different than around a red dwarf, or a class A star? One thing that has already stood out at me is the larger than expected number of neptune size planets which by definition must be fairly close to their parent stars. We have no analogue for this in our solar system, but Kepler has just discovered that they are far more common than close-in jupiter sized planets which by the radial velocity findings that have dominated the headlines for the past 10 years. I have to take Torbjorn Larsson OM to task on these projections. Potentially the most Earthlike of the lot found is likely Kepler-268 which has an estimated radius of 1.75 times the Earth, a year of 110 days and it sits at 0.41 astronomical units from its parent star. This should give it an estimated surface temperature of 295 degree Kelvin or 22 degrees Celsius. The one problem though is this planet may not have a stable thermal environment. The planet may turn out to have life, but in order for it to have complex life I think the environment must be sufficiently stable, with only punctuated chaotic periods. On Earth conditions are similar to that, where there are prolonged periods with modest variations, and maybe every 10^7 to 10^8 some form of serious disruption. So I would suspect that while there may indeed by 10^8 to 10^9 planets which may harbor life, maybe only 10^3 planets might be in sufficiently stable configurations to permit complex life. It also has to be pointed out that each of these planets is unique in it geology, chemistry, atmospheric dynamics and complexity. We do not know whether biology is an inevitable chemical process given a sufficiently broad set of conditions. We do not know with certainty whether biology is some large “attractor basis” for complex structures and chemistry. It also might turn out to be just one of a number of possible complex self-adaptive, self-regulating and self-replicating structures which might exist. Given the wide range, indeed almost infinite, set of possible configurations which could exist on these planetary events it might turn out that what we identify as biology is just one example of self regulating complex structures. ^ It is humbling to think that in the 15 years since the first planets were found (around a sun-like star anyway) we’ve gone from behemoths that couldn’t possibly support human life, to a candidate that we should theoretically be able to stand on without cold weather protection. (Breathing is another matter though as who knows whether it has an atmosphere at this point). Where will we be 15 years from now? Heck, even within 5 years we should have a good sample of the atmospheres of these worlds, assuming the Terrestrial Planet Finder or a similar mission is launched. Finding another planet that is habitable for humans is no longer a matter of if, it’s really just a matter of when. None of these planet candidates are genuinely comparable with the Earth, as none has an orbital period greater than 100 days. The orbital period of Venus, a planet which is outside the habitable zone in our system, is 224 days. That of Mercury is 88 days. So nine-tenths of these candidates are closer in to their star than Mercury is to ours. The likelihood of life is dependent upon a planet being in an orbit around a main sequence star, because only such a star is stable for geological eons, the time life took to evolve on Earth. But no planet orbiting a main sequence star is going to escape being fried if it is – relatively speaking – inside the orbit of Mercury. Also, these candidates are presently merely variations in stellar brightness. This is quite common in stars, and often has nothing to do with other bodies partially occluding the star. There are many variable stars already known, and the more sensitive the measurements taken of a star, the more likely one is to detect even small variations in the star’s intrinsic luminosity. Further, in our own case, it is most likely that life evolved on the Earth only because of the existence of the Moon, which exerts a gyroscopic stabilising effect on the Earth’s axial spin, keeping our planet’s rotation stable over eons. Without the Moon, it is believed that life could not have developed here. So being within the habitable zone of a star is not the only precondition for the existence of life. The Keppler results are interesting, but they are a long way from being a confirmation of the existence of genuine planets. And a very long way from being a confirmation of the presence of life. I’ve been involved in the subject of exo-planets since around 1984. I won’t be surprised to discover that there is an ideal “Earth” world out there somewhere. It is bound to happen, let’s face it, it is already becoming obvious that planet formation is a rule, not an exception. Gravity is the universal force of attraction between all matter. Where loose matter exists in sufficient volumes, things are going to happen. Stars are an obvious consequence of massive amounts of matter collapsing under gravitational forces to eventually compress atomic nuclei into thermonuclear chain reactions. As stars collapse toward primary ignition, as with planets and lesser bodies, things start to rotate. Clouds of debris from which solar systems evolve rotate. Planets condense and orbit the core body that is to become their parent star and eventually orbits are born. The dark body at the center becomes a star. Solar systems are a natural occurrence. Gravity’s nature is to bring “spin” to things that collapse inward. Who knows, perhaps Robert Jastrow was correct in his book “Red Giants And White Dwarfs” that our solar system is the result of a super nova explosion? It may explain things as to the abundance of heavy metals in our sun and planets. Why wouldn’t that same possible mechanism be at play every where in our universe. I can’t visualize a solar system evolving out of hydrogen and helium. It makes no sense in quantum mechanics.There is apparently a large volume of heavy materials distributed in space and it suggests to me that stellar explosions are the key behind all of it. Those solar systems came about because heavy atoms evolved in the hearts of stars and that final gasp of life as a star detonates is what gave birth to those heavy materials that brought solar systems and “life” into existence. It’s an evolutionary process………think about it!